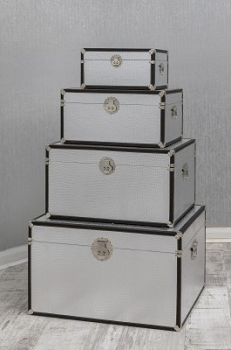 Our Crocodile Trunk Set is also available in Silver! Featuring the luxurious bicast Leather Crocodile skin design creating a functional set of trunks that can be displayed throughout your Home & moved with ease to suit wherever the need for additional storage is, whilst doing it in style. This set provides 4 spacious & contemporary home storage boxes that are carefully constructed with man made timbers, on trend and a wonderful statement piece that is full of character. They can be placed in your Bedroom, Home Office or even your Hallway! Also available in White so you can find the perfect storage trunks or even mix & match throughout. The Crocodile Collection also includes Bedside Cabinet, Chest, Wellington Drawers, Dressing Table & more!